With Oktoberfest in full swing (17th September to 3rd October) Cactus has some top tips on what to do, wear, eat and what German expressions you cannot do without! 1. Entrance is free. Beer is not free. To enter the festival and beer tents is free of charge a�� a couple of beers and chicken will cost you around 35 euros a�� remember to take cash. The tents get very busy, the smaller the group you are in, the quicker and easier it is to get a seat. The festival also offers wine, cider, soft drinks and schnapps. However, if youa��re drinking schnapps and trying to keep up with the beer drinkers you are likely to end up on the floor with very little memory of the festival. You are not allowed to dance on the tables. So dona��t try it, unless you want security to remove you from the tent. Do go in traditional costume such as Lederhosa��n (for the men) and Dirndl (for the women). 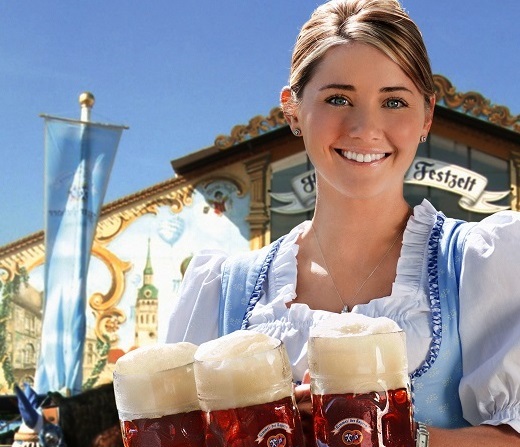 Dona��t wear silly Oktoberfest hats a�� you will look like a tourist. Do try the classic Wiesn-Hendl (grilled chicken) or the Ochsenbraterei (Ox Burger). Ordering food and drink: (Ein, zwei, drei, vier, fA?nf) Bier, bitte! (One, two, three, four, five) beers, please! (Ein, zwei, drei, vier, fA?nf) Wiesn-Hendl, bitte! (One, two, three, four, five) chicken, please! If Oktoberfest inspires you to visit Germany and pick up some useful German, Cactus Language has German language courses in Berlin, Munich, Hamburg, Cologne and a number of other German cities. To find out more information simply call us on 01273 830 960 or email us. Our multilingual team will be happy to answer any questions you may have.